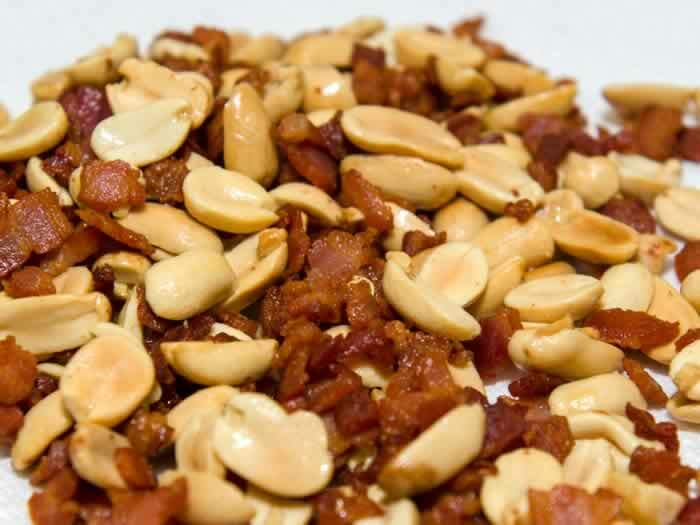 Caramelized bacon and peanuts are only minutes away with this fast-and-easy chef’s caramelization technique. I can still remember the first time I made a perfect caramel syrup. Pure magic. Happy dance. And once I mastered the technique, if it could be caramelized, it would be caramelized. Dried rose petals, popcorn, walnuts, almonds, hazelnuts, peanuts, pumpkin seeds, cocoa nibs, dried coconut, oranges, apples, pears, butternut squash, pumpkin, and yeah, even bacon. Just about everything tastes better with caramel. At the Northwest Culinary academy and in my early writing, I almost always taught the caramel technique called the wet method. This involves cooking sugar with water until the water evaporates and the sugar then caramelizes. 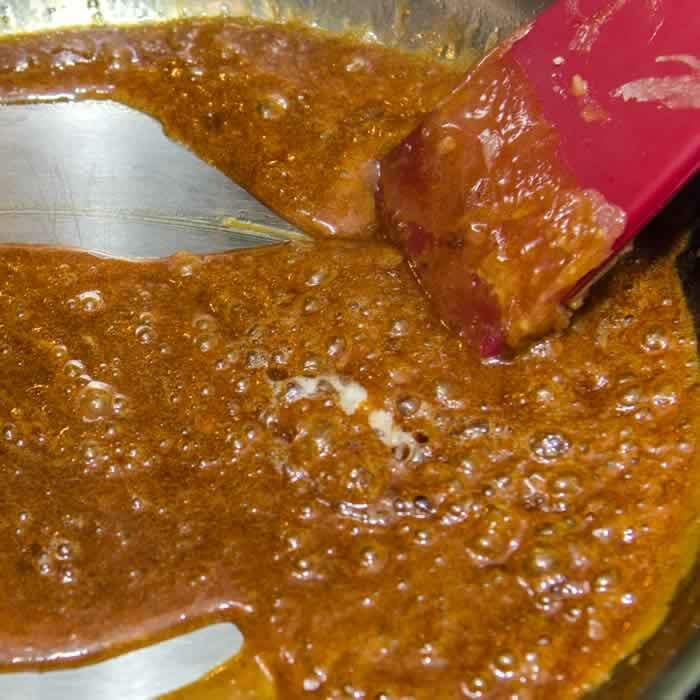 This method is slower and gives the cook more control over the caramelization process. It’s primary downside, besides time, is crystallization of the sugar midway through the process. To avoid this, the cook must keep the sides of the pan free of sugar crystals, either by washing the sides down with a wet pastry brush or using a lid to cause steam to accomplish the same thing. But these days, who has time to stand by the stove while the water evaporates? And who wants to worry about sugar crystals forming? Not me. So the method I use here to melt the sugar is the dry method–the method most often used by professional chefs. The dry method is not difficult, but may take some practice to master. If you have no experience with this method, be prepared to discard just the sugar in your first couple of attempts. Without water as a buffer, the sugar melts, then caramelizes very quickly. If you error, it will probably be on the side of letting the caramel get too dark. If in doubt, toss it out. 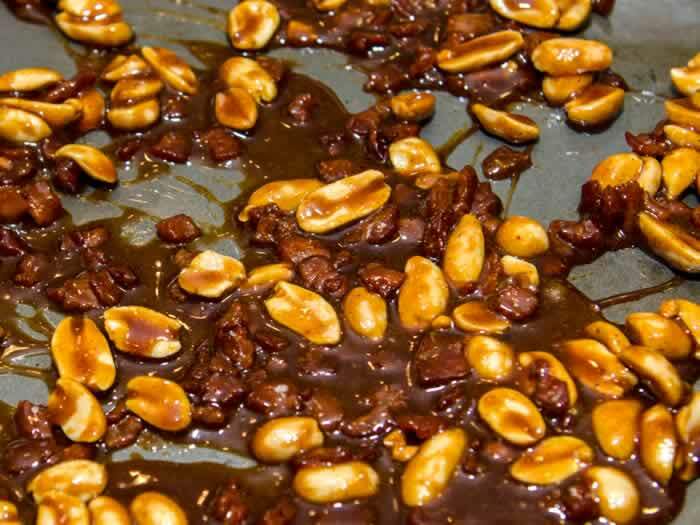 Don’t risk adding the toasted nuts and cooked bacon to a caramel that looks and smells burnt. 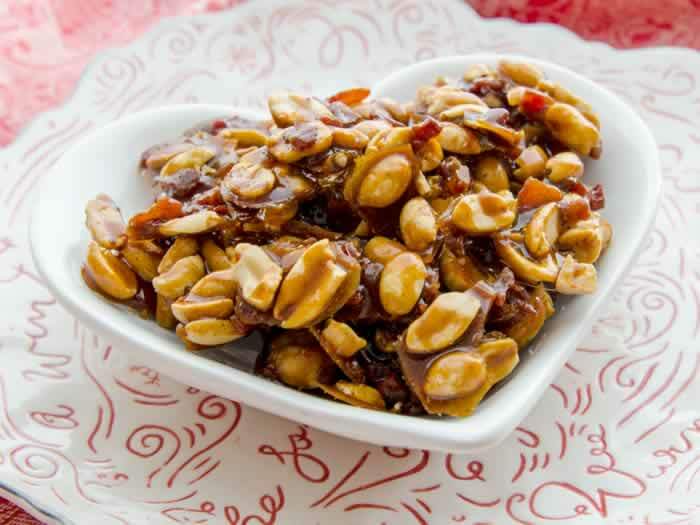 Burnt sugar, roasted peanuts, smoky bacon, and smoky chiles make a heavenly flavor pairing. great as a sweet nibble, but also as an embellishment for all kinds of chocolate desserts. Leave in chunks, or seal in a Ziploc bag and crush with a mallet for a finer crumble. In a small bowl, combine chile powder, cinnamon, and salt. Locate a silicon spatula and set the spices, butter, vanilla, peanuts, and bacon next to the stovetop, within easy reach. Lightly coat a 9- by 12-inch, edged baking sheet with vegetable spray and set it next to the stovetop as well. In a 9½-inch-diameter stainless steel-lined sauté pan (light color interior is important), add the sugar. Turn on the heat to high and watch closely as the sugar starts to melt. Swirl the sugar in the pan to distribute the portions that are caramelizing first, and then if necessary, stir with a silicon spatula to evenly melt the sugar. 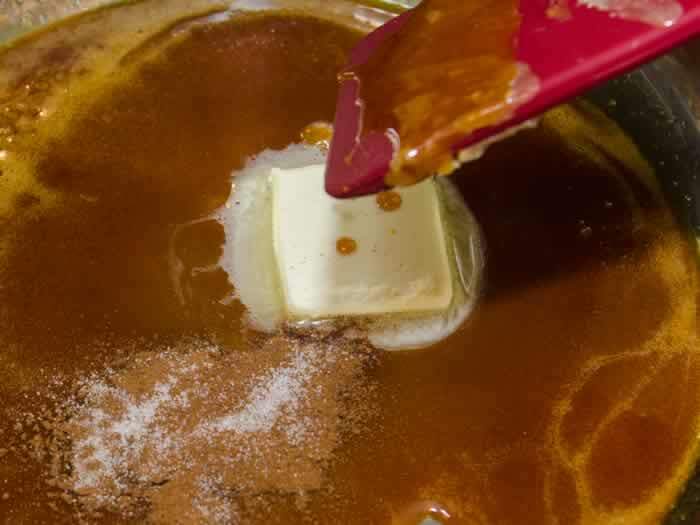 Remove the pan from the heat immediately after the caramel turns a medium amber color, and swirl in the butter, spices, and vanilla. Be careful as the mixture may sputter and foam up. Stir with a silicon spatula until creamy and smooth. 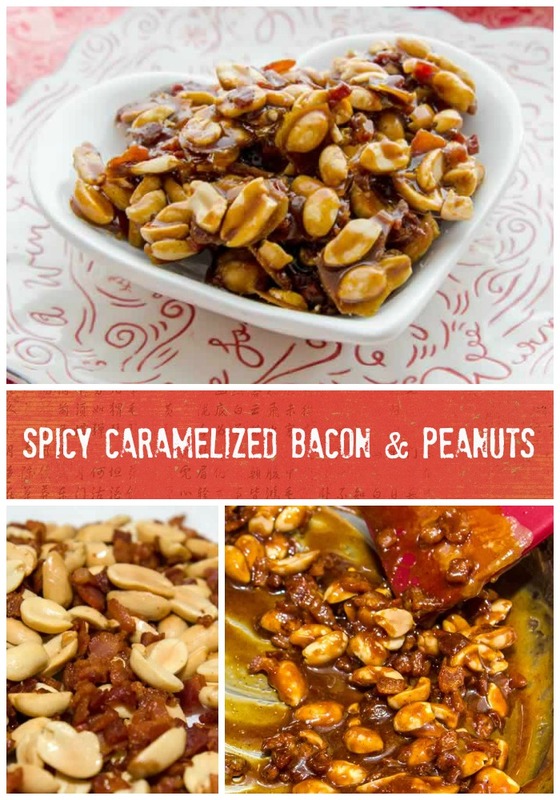 Quickly add the peanuts and bacon, and coat with caramel. Pour onto the prepared pan, and separate as best you can with the spatula. Cool completely, lift from the pan with a metal spatula, and break into small chunks with your hands. Store in an airtight Ziploc bag at room temperature for up to 2 days. It\\\’s official, Susan. You are now my FFBBFF (Fellow Food Blogger BFF), This combination speaks to every late night munchie craving I have ever had, or ever will have, forever. O-my. Susan I only have 2 words- Flavour. Sensation. I always fail at the dry method. ALWAYS. Like, I’ve had to throw away pans because the sugar is so burnt. This looks so delicious though and I wish I was better at candy making so I could try it! What a creative combination! I can’t wait to try this snack! Yeah, I pretty much want to see that waiting for me on Saturday! These look fantastic! What a delicious treat and your photos are great. Can’t wait to give it a try, Susan! I am mesmerized by that gorgeous heart! 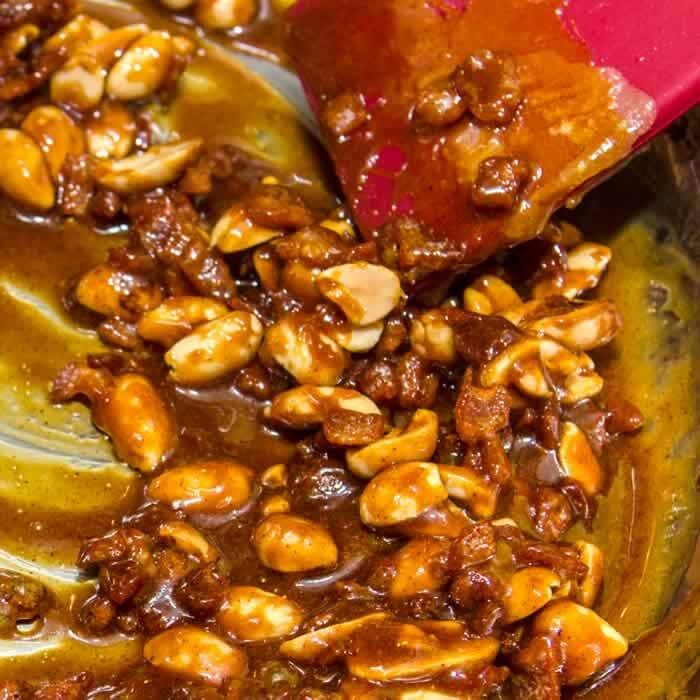 I thought I made caramel once…but, your explanation of the techniques was so helpful…I think I just found a project for me and my girls!